Sister Location: Custom Night is a free downloadable fan-made game. It brings you some different points from the original game by Scott Cawthon. 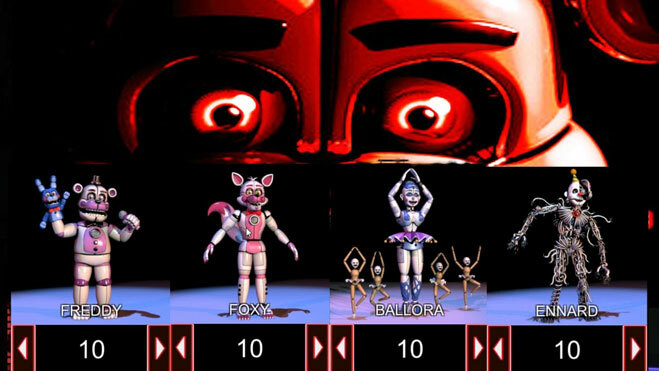 Ballora and Foxy stay in the Main Room, and they are attempting to get close to the window for killing you. Make sure you get them return to their stage by giving them a controlled shock. About Freddy, he is in the side room and you can get to his place using the left vent in the main room. Don’t forget to check on him frequently to keep him calm. Ennard can be in any room, so please check the cameras carefully. He will come to the office room, so make sure you stop him from getting into it, or else he will kill you. Close the doors in time to block his way. Your goal is to stay alive until the end!